• Participated in Seamaster ITTF World Tour Indian Open 2017 held at New Delhi,INDIAfrom 14th to 19th Feb 2017. • Gold Medal in Teams in South Asian Jr. T.T Championship held at New Delhi, India from 17th to 19th June 2015. • Gold Medal in Doubles in South Asian Jr. T.T Championship held at New Delhi, India from 17th to 19th June 2015. • Bronze Medal in Singles in South Asian Jr. T.T Championship held at New Delhi, India from 17th to 19th June 2015. • Bronze Medal in Teams in Indian Jr.& Cadet Open T.T Championship held at Indore (Madhya Pradesh) India from 9th to 13th September 2015. • Bronze Medal in Doubles in Indian Jr.& Cadet Open T.T Championship held at Indore, MP, India from 9th to 13th September 2015. • 6th Position in Asian Jr. T.T Championship held at Kuala Lumpur, Malaysia from 22nd to 26th July 2015. • 9th Position in Team in Asian Junior T.T Championship held at Mumbai, India. 12th to 16th September 2014. • Gold Medal in Team in South Asian Junior Championship held at Pakistan from 27th to 29th August. 2014. • Gold Medal in Doubles in South Asian Junior Championship held at Pakistan from 27th to 29th August 2014. • Silver Medal in Individuals in South Asian Junior Championship held at Pakistan from 27th to 29th August 2014. • Participated in Junior Asian T.T Championship held at Thailand from 21st to 25th July 2010. • Bronze medal in Team in Chengdu Jr. & Cadet Open T.T Championship held at Chengdu, China from 30th June to 4th July 2014. • Participated inChina Jr.&CadetOpenT.TChampionship held atTaicang from 23rd to 27th June 2014. • Participated inPolish Jr.&CadetOpen T.TChampionship held atPoland from 28th to 1st june 2014. • Participated in Slovak Jr. Open T.T Championship held at Slovakia from 22nd to 25th may 2014. • Silver medal in jr boys singles in Melta Jr. & Cadet Open T.T Championship held at Melta from 15th to 18th May, 2014. • Silver medal in Jr Boys Doubles In Fajr Cu Junior Open T.T Championship Held at Iran from 28th to 30th November, 2013. • Bronze medal in Jr Boys Singles In Reliance Indian Jr. & Cadet Open T.T Championship held at Mumbai from 16th to 20th October, 2013. • Bronze medal in Jr Boys Doubles In Reliance Indian Jr. & Cadet Open T.T Championship held at Mumbai from 16th to 20th October, 2013. • Bronze medal in Jr Boys Team In Reliance Indian Jr. & Cadet Open T.T Championship held at Mumbai from 16th-20th October, 2013. • 9th Position In Team InAsian Junior T.T Championship held at Doha, Qatar 30th-3rd September, 2013. • 16th Position In Team in World Junior T.T Championship held at Hyderabad. India from 9th-16th December, 2012. • Bronze medal in Individuals in El-salvador Junior And Cadet Open World T.T Tournament held at San Salvador, Central America from 16th-19th August, 2012. • Bronze medal in Team In El-salvador Junior And Cadet Open World T.T Tournament held at San Salvador. Central America from 16th -19th August, 2012. • Gold medal in team in Guatemala Junior And Cadet Open World T.T Tournament held at Guatemala. • Central America from 9th -12th August, 2012. • Silver medal in Individuals In Guatemala Junior And Cadet Open World T.T Tournament held at Guatemala, Central America from 9th-12th August, 2012. • Silver medal in Doubles In Guatemala Junior And Cadet Open World T.T Tournament held at Guatemala, Central America from 9th-12th August. 2012. • Participated in Slovakia Junior Open World Circuit Championship held at Senic, Slovakia.17th-20th May, 2012. • Gold Medal in Individuals In South Asian Junior Championship held at Shillong, India from 14th-16th June, 2012. • 6th Position in Team in Asian Junior T.T Championship held at Jiangyin, China from 11th-16th July, 2012. • Bronze Medal in Spanish Youth Championship held at Barcelona, Spain from 4th-8th May, 2011. • Participated in French Junior World Circuit held at Metz, France from 27th April-1st May 2011. 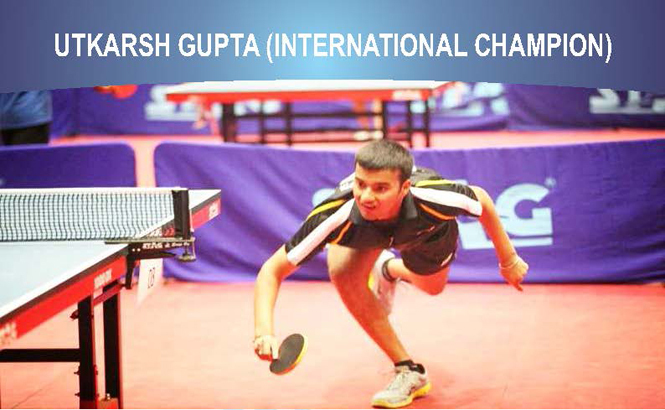 • Gold medal in US Open Junior ITTF circuit held at U.S 30th june to 4th july 2011. • Gold medal in team Championship in Indian Junior and Cadet Open ITTF Global Junior Circuit held at Dehradun, India September 28th-2nd October, 2011. • Silver Medal in Individual in Indian Junior and Cadet Open ITTF Global Junior Circuit held at Dehradun, India September 28th to 2nd October, 2011. • Bronze Medal in Doubles in Indian Junior and Cadet Open ITTF Global Junior Circuit held at Dehradun, India September 28th-2nd October, 2011. • 5th Position in Team Championship in Asian Junior Championship held at New Delhi, India 20th-25th July, 2011. • 9thPosition in Individual inAsian JuniorChampionship held atNewDelhi,India 20th-25th July,2011. • Gold Medal in US Open Junior ITTF Circuit held at U.S.30th-4thJuly, 2010. • Gold Medal in South Asian T.T Championship 2010 in Sub Jr. Boy’s Singles held at Dehradun, India 5th-6th June, 2010. • 5th Position in Global Cadet Challenge & World Juniors Finals held at Hyderabad, India from 1st-7th November, 2010. • Bronze Medal in Team Championship In Hong Kong Jr.& Cadet ITTF Jr. World Circuit held at Hongkong from 4th-8th August, 2010. • Participated in Junior Asian T.T Championship held at Thailand from 21st-25th July, 2010. • Silver Medal in Youth boys team in Youth Nationals T.T championship held at vadodara from 6th to 11th january 2017. • Bronze Medal in Youth boys doubles in Youth Nationals T.T championship held at vadodara from 6th to 11th january 2017. • Gold Medal in Youth Boys Team in All India Inter Institutions T.T Championship held at Jaipur from 24th to 29th July 2016. • Gold Medal in All India Inter University T.T Championship held at BHOPAL from 8TH to 13th March 2016. • Bronze Medal in Youth Boys Singles in National Ranking T.T Championship (North Zone) held at Chandigarh from 25th to 30th June 2016. • Bronze Medal IN Mens Singles in National Ranking T.T Championship(Central Zone) held at Indore from 26th September to 1st October 2016. • Gold Medal in North Zone Inter-University held at New Delhi from 17th -19th December, 2015. • Silver Medal in Teams in 45th All India Inter Institutional T.T Championship held at New Delhi from 28th July to 2nd August, 2015. • Bronze Medal in Youth Boys Singles in National Ranking T.T Championship held at Chennai, Tamilnadu from 11th to 16th August, 2015. • Silver Medal in Jr. Team in 76th Youth & Junior National T.T Championship held at Alleapy from 25th- 30th November, 2014. • Silver Medal in Youth Team in 76th Youth & Junior National T.T Championship held at Alleapy 25th to 30th November, 2014. • Silver Medal in Jr. Singles in 76th Youth & Junior National T.T Championship held at Alleapy 25th to 30th November, 2014. • Silver Medal in Youth Singles in 76th Youth & Junior National T.T Championship held at Alleapy 25th to 30th November, 2014. • Gold Medal in Junior Boys in National Ranking T.T Championship (East Zone) held at Durgapur from 28th October to 2nd Nov 2014. • Bronze Medal in Junior Boys in National Ranking T.T Championship (West Zone) held at Gandhidham from 13th to 18th October, 2014. • Gold Medal in Junior Boys in National Ranking T.T Championship (Central Zone) held at Indore from 6th to 11th October, 2014. • Bronze Medal in Jr. Singles in 75th Youth & Junior National T.T Championship held at Guawhati 15th to 20th January, 2014. • Bronze Medal in Jr. Team in 75th Youth & Junior National T.T Championship held at Guawhati 15th to 20th January, 2014. • Bronze Medal in Youth Boys Team in 75th Youth & Junior National T.T Championship held at Guawhati 15th to 20th January, 2014. • Bronze Medal in Junior Boys in National Ranking T.T Championship (East Zone) held at Siliguri from 25th to 30th November, 2013. • Bronze Medal in Mens Singles in National Ranking T.T Championship (West Zone) held at Thane from 6th to 11th October, 2013. • Gold Medal in Mixed Doubles in 74th Senior National T.T Championship held at Raipur 7th to 12th January, 2013. • Gold Medal in Junior Boys in National Ranking T.T Championship (Central Zone) held at Jodhpur from 23rd to 28th September, 2012. • Bronze Medal in Doubles in 74th Youth & Junior National T.T Championship held at Indore from 5th to 10th February, 2013. • Silver Medal in Team in School National Games held at New Delhi from 2nd to 8th January, 2013. • Silver Medal in Individual inSchoolNationalGamesheld atNewDelhi from 2nd to 8th January,2013. • Silver Medal in Junior Boys in National Ranking T.T Championship (North Zone) held at New Delhi from 26th -1st December, 2012. • Gold Medal in Team Championship in National School Games held at Rajkot, Gujarat 16th-21st January, 2011-12. • Gold Medal in Individual in National School Games held at Rajkot, Gujarat 16th-21st January, 2011-12. • Silver Medal in Team Championship in Junior & Youth National Championship held at Siliguri from 3rd-8th January, 2011-12. • Bronze Medal in Team Championship in Junior & Youth National Championship held at Siliguri from 3rd-8th January, 2011-12. • Gold Medal in Individual inCBSENationalChampionship held atVaranasi 14th-18thOctober,2011. • Silver Medal in Sub Jr. Boys Single in 73rd National T. T. Championship held at Indore from 3rd- 8th January, 2011. • Gold Medal in Sub Jr. National Ranking (North Zone) held at Delhi from19-23rd December, 2010. • Gold Medal inSub Jr.NationalRanking (SouthZone)held atBanglore from 28th July -1st August,2010. 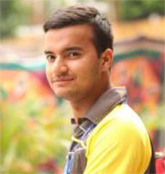 • Gold Medal in Single CBSE National Championship held at Indore from 15-19th December, 2010. • Gold Medal in Singles in School National Games held at Nasik From 13-17th January, 2011. • Gold Medal in Team Championship in School National Games held at Nasik from 13-17th January, 2011. • Gold Medal in The Sub-Junior Boys Single in School National Games held in Godhra, Gujarat from 8th-13th October, 2009. • Gold Medal in The Sub-Junior Boys Team in School National Games held at Godhra, Gujarat form 8th-13th October, 2009. • Gold Medal in The Sub- Junior Boys Single In C.B.S.E National T.T Championship held at Nagpur from 7th -11th December, 2009. • Silver Medal in Sub Junior Boys National Ranking T.T Championship (East Zone) held at Silliguri From 7th -11th November, 2009. • Silver Medal in Sub Junior Boys National Ranking T.T. Championship (West Zone) held at Thane From 13th -17th December, 2009. • Silver Medal in Sub Junior Boys Team in Sub Junior National T.T Championship held at Chennai 21st-26th December, 2009. • Bronze Medal in Sub Junior Boys Single in Sub Junior National T.T. Championship held at Chennai 21st – 26th December, 2009. • Bronze Medal in Sub Junior Boys Doubles in Sub Junior National T.T. Championship held at Chennai 21st-26th December, 2009. • Bronze Medal in Junior Boys Team Championship in Jr. & Youth National T.T. Championship held at Raipur 30th December, 2009 to 4th January, 2010. • Bronze Medal in Junior Boys Doubles In Jr. & Youth Boys National T.T. Championship held at Raipur 30th December, 2009 to 4th January, 2010. • Silver Medal in The Sub Junior National Ranking T.T Championship (North Zone) held at Jodhpur, Rajasthan from 7th to 11th January, 2010. • Bronze Medal in Cadet Boys Team in 70th Cadet & Sub Junior National T.T. Championship held at Vijaywada from 24th to 30th December, 2008. • Silver Medal in Cadet Boys Singles in 70th Cadet & Sub Junior National T.T. Championship held at Vijaywada from 24th to 30th December, 2008. • Bronze Medal in Sub Junior Boys in National Ranking T.T. Championship (East Zone) held at Bolpur from 5th to 8th November, 2008. • Gold Medal in Sub Junior Boys Team Championship in National School Games held at Chandigarh from 8th to 13th January, 2008. • Bronze Medal in Sub Junior Boys Single in National School Games held at Chandigarh from 8th to 13th January, 2008. • 5th Position in Sub Junior Boys Single in National Ranking T.T Championship (North Zone) held at Delhi from 11th to 15th December, 2008. • 5th Position in Sub Junior Boys Single in National Ranking T.T. Championship (West Zone) held at Raipur from 21st to 25th December, 2008. • Bronze Medal in Cadet Boys Team in 69th Cadet & Sub Jr. National Championship held at Chennai from 24th to 29th December, 2007. • Bronze Medal in Sub Jr. Boys Team in 69th Cadet & Sub Jr. National Championship held at Chennai from 24th to 29th December, 2007. • Bronze Medal in Junior Boys Team in 69th Jr. & Youth National Championship held at Indore from 16th to 21st December, 2007. • Silver Medal in Jr. Boys Team in C.B.S.E National Championship held at Mumbai from 2nd to 6th December, 2006. • Participation in Cadet Boys in 68th Cadet & Sub Jr. National Championship held at Kerala from 18th to 24th November, 2006. • Participation in Cadet Boys in 67th Cadet & Sub-Junior National Championship held at Pondicherry from 27th December, 2005 to 2nd January, 2006. • Silver Medal in Junior Boys Team in C.B.S.E National Championship held at Chandigarh from 19th to 22nd November, 2005. • 4th Position in Sub-Junior Boys Team in C.B.S.E National Championship held at Jaipur from 26th to 30th December, 2004.